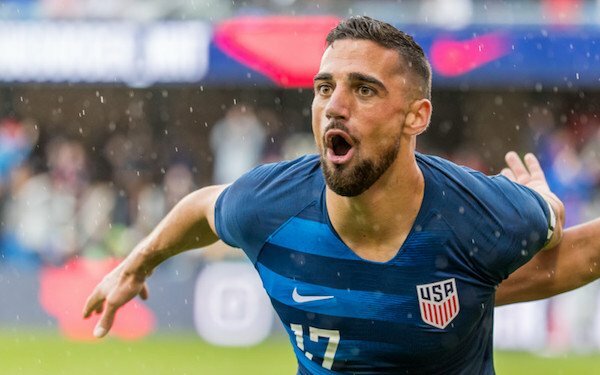 Sebastian Lletget's U.S. national team career came full circle on Saturday when he returned Avaya Stadium, not far from where he grew up in Northern California. Like he did when he played the first time at the home of the San Jose Earthquakes, Lletget scored the winning goal for the USA. And he later added an assist on the second goal scored by Paul Arriola to give the USA a 2-0 win over Costa Rica. But it was a homecoming filled with so much emotion he admitted he cried afterwards. Lletget's first game at Avaya Stadium came in March 2017 when the USA beat Honduras, 6-0, for its first win of the Hexagonal after two defeats and a change of coaches. Lletget's goal came in the fifth minute, but his evening -- and season -- was done 13 minutes later. Honduran defender Ever Alvarado fouled so aggressively that Lletget suffered a Lisfranc fracture in his left foot. He was injured him so badly he missed the rest of the MLS season with the LA Galaxy and didn't take part in another match in the USA's unsuccessful World Cup qualifying campaign. “People don’t realize what it is for an athlete, when you get injured like that,” Lletget, 26, said. “I got the goosebumps even training here [Friday] morning with the team." Lletget came off the bench Saturday and scored when he was at the far post to head home a cross from Jonathan Lewis, another sub -- the same spot of the field he was 22 months earlier when tapped in a rebound of a shot by Christian Pulisic. Lletget's road back to the national team was not easy. The Galaxy missed the playoffs in 2018. He didn't play for the national team again until last November when he was a sub in losses to England and Italy. Lletget was one of veterans of the group picked by Gregg Berhalter for his first camp in January -- the only other player who played on Saturday and also played in the Hexagonal was Arriola -- but he didn't start. "Sebastian is an interesting one because he's got a load of ability, a very good skill set," said Berhalter. "He'll be the first to say he struggled with the structure a little bit in beginning. I think it was part of his mentality to hang in there and keep going, keep learning, keep pushing himself that got him into these positions. All the credit goes to Sebastian, and how when he plays in structure, now his skill set can take over and allow him to be very effective." Lletget, who now has seven caps for the USA, admitted that how Berhalter wants his players to play requires a lot of learning. “Our job is to learn," he said, "and he’s teaching a style of play that – it’s not going to come easy to a lot of guys. Many of us have never been coached like this, to so much detail. But we appreciate it, especially me. I learned a lot, and one thing I told him after the game is that I learned so much in this camp, and I’ll continue to learn and study the way he wants to play this game." Lletget, who came off the bench for Djordje Mihailovic in both games, will face stiff competition from other midfielders to make the U.S. squad for March friendlies against Ecuador in Orlando and Chile in Houston. But he is a player with unique skills, capable of working between the lines and breaking down defenses, especially in late parts of a game like he did effectively against both Panama and Costa Rica. "I’m definitely up for it," he added.